Experiences 10 days and 9 nights in Northern Sikkim. There are several popular places for trekking in Northeast India, but Goechala Trek, is one that experiences maximum popularity, since its promises splendid scenic extravaganza and thrilling adventurous hike that can leave your heart pumping, yet filled with pleasure. The terrain to Goechala is not easy and the trekking level is from moderate to difficult. It is a tiny place located in Sikkim and is a dream for hundreds of adventure seekers throughout the country. Entangled amidst vibrant and colourful flora and fauna, it is also the way to the astounding Kanchenjunga National Park to dive into the natural beauty. It is not about Kanchenjunga alone but the combination of other big summits around it makes Goechala Trek an absolute adventure to many and it is a great pleasure to watch these summits from the landscapes filled with exotic flowers and immensely attractive meadows and dense rhododendron forest. Our driver will pick you up from Bagdogra Airport and thereon you will head for your journey to Yuksom, the starting point of Goechala Trek. The Drive to Yuksom from Goechala will be 8 hours. Stay overnight in a hotel. After breakfast, we will start our trek to Sachen. The trek will be a moderate one, gradual climb for 2.5 hours after which the trail becomes steeper up to Sachen. The trail will pass through thick forest, mini waterfalls, bridges and streams. The coolness of the forest will take away all your tiredness. Today you will reach an elevation of 5643 feet. Stay overnight in a camp. After breakfast, we will move our journey towards Tshoka. The trek will again be a moderate one, taking you through mixed oak forests and then rhododendrons. You can stop by for a sip of tea and some snacks at Bhakim. Upon reaching, you can spend some time exploring Tshoka. Slightly uphill are the cafes where trekkers can try the local malt beer Tumba. You can also ask the café owners for the keys to the monastery. Follow the trail as it leads out of Tshoka, cross the small wooden bridge over the pond and head to the monastery. It is a quiet place worthy of a quick visit. There are just a few Tibetan families residing here. Stay overnight. After breakfast, we will move on towards Dzongri, place surrounded in all directions by the mighty peaks of the Kanchenjunga range. The trek is a difficult one, mostly steep climbing. After a hard climb from Tshoka, Dzongri is a welcome sight for trekkers. The trail will take you through dwarf rhododendrons and some amazing views. Stay overnight. After breakfast, we will move onwards for our journey to Thansing. The trek is a moderate one, gentle descent for about 2 hours followed by a steep descent to Kockchurang. From Kockchurang the trail is continuously ascent till Thansing. You can wash up on the way with the fresh water flowing through the spring, which is 10-15 minutes away on a lower trail to Kockchurang. You can also spot birds on the trail. Thansing will be a great camping experience. You will also reach an elevation 13,024. After breakfast, we will start for Lamuney. The trek is easy, gradually ascending trail which suddenly becomes steep towards the end as you approach the destination. Stay overnight. After breakfast, we will start for Goechala. The trek is a moderate one, a continuous ascent of 2 hours to reach the viewpoint. This is the longest day of the trek; an early start will give multiple advantages. We will finally reach the viewpoint from where you can see the sun rays touching Kanchenjunga range. After spending a quality amount of time, we will leave back for Kockchurang. 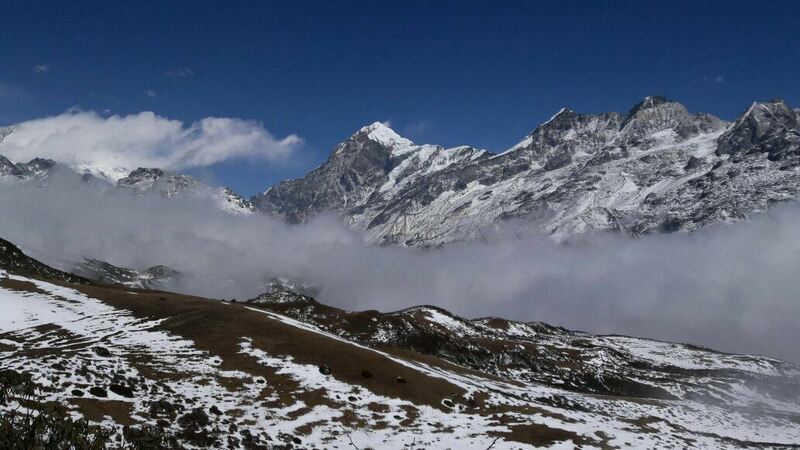 Today we will reach an elevation of 13,473 feet which will be the highest in the trek.Stay overnight. After breakfast, we will retrace our steps back to Tshoka. The trek will be a difficult one, relatively flat trail to Phedang for about 4 hours followed by descent to Tshoka. We can enjoy the scenery falling on our trail. Stay overnight. After breakfast, we will leave for our last destination of this amazing trek i.e. Yuksom. The trek is a moderate one, continuous descent to Sachen, followed by an undulating trail to Yuksom. Stay overnight. After breakfast, we will drop you at the Bagdogra Airport for your onward journey. • Camping and mentioned activities. • Accommodation in two bedded room in Yuksom. • GST, all toll and driver fee.